On behalf of admin of JML Law, A Professional Law Corporation posted in Sports Injury on Tuesday, Jan 16 2018. Whether you’re a professional athlete or weekend warrior – or more commonly, your kid plays for a college team – do not underestimate the risk of sports injuries. After all, sports injuries can not only ruin your sports career, but also ruin your life by leaving you disabled or disfigured. Causes of sports injuries vary from one can to another, but our Riverside sports injury attorney at JML Law has outlined the most common causes behind sports traumas. Training too often, training at high intensity, or having inadequate recovery time between trainings can cause overtraining, which in turn can result in sports injuries. Student athletes and kids playing for college teams as well as professional athletes are more likely to experience overtraining compared to weekend warriors, while the school, athletic facility, organization or coach can be held liable for the injuries for not providing sufficient rest in between trainings. Increased heart rate even during rest. If you believe your school, athletic facility or coach put your health and safety at risk and fail to provide adequate rest periods in between sessions, consult our Riverside sports injury attorneys to find out the best legal options in your particular case. Take action before overtraining causes serious injuries that will require you to spend enormous amounts of money on medical bills and recovery. Like any mechanical tool, our muscles can become worn-out from repeated actions that apply too much pressure too often. Similar to the door hinge that begins to squeak if you keep opening and closing it over and over again, certain group of muscles and joints can suffer repetitive strain injuries due to repeated actions. You must’ve heard about such injuries as tennis elbow, golfer’s knee, thrower’s shoulder and jumper’s knee, all of which are caused by overuse. This type of sport injury is usually accompanied by pain, which can get worse over time. Also, swelling and bruising are not uncommon in overused muscles. Our sports injury lawyers at JML Law, a Riverside-based law firm specializing in personal injury claims and lawsuits, warn that many sports organization and facilities fail to provide a safe environment for their athletes or students. In particular, improper warm-up and inadequate training schedules are to blame for overuse injuries. Improper warm-ups put both professional athletes and weekend warriors at risk of sport injuries, as it’s vital to increase circulation of blood to the muscles and warm-up the muscles and joints for the physical demands that are about to come. Performing exercises with improper form and technique is a recipe for sports injuries. Coaches and sport facility staff assume responsibility to make sure their athletes and students are using a proper form when training. Impact injuries are arguably the most serious sports injuries of all. 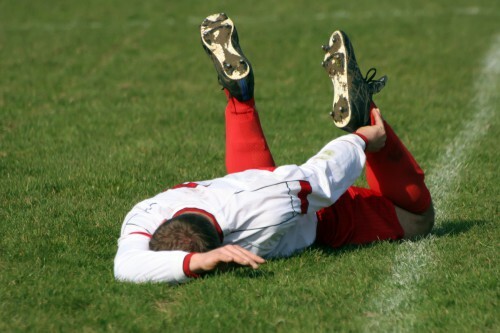 This type of injury is more common in contact sports such as basketball, football, soccer, rugby and others. Dislocated joints, back and neck injuries, ligament and tendon damage, fractures, head injuries, concussions… you name it. Our Riverside sport injury attorneys at JML Law say that sports facilities, organizations and coaches can be held liable even for this type of injury if they fail to ensure a safe environment or provide the injured with an adequate and quick medical treatment. Consult our sports injury attorneys in Riverside at JML Law to determine liability in your particular case and find out the best course of action to seek compensation for your injuries and damages. Call our offices at 818-610-8800 or send an email to get a free consultation.